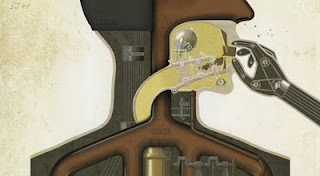 In this video, Henning Lederer has animated a historical poster by Fritz Kahn entitled Man as Industrial Palace (1926), who is considered by many to be the founder of conceptual medical illustration. Although we now know more about the human physiology than Fritz Kahn did, Henning Lederer in this preview clip has merely kept the illustration relevant to the 1920's interpretation. The sound design by David Indge similarly depicts the action in the animation with vintage industrial sound samples.